Will we set a record for Africa on 20 Nov? Telana Simpson, also known as the 'Matchstick Girl, has been trading a single matchstick up in value with the ultimate goal of reaching office space, which she wants to offer to start-up entrepreneurs to help them get their businesses off the ground. She is hosting South Africa's first SWARM Party where she has organised four of South Africa's up and coming bands to play at the Bluesroom in Village Walk. 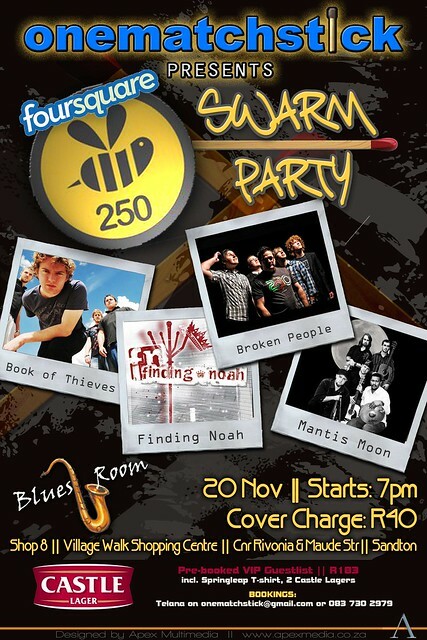 The bands are Broken People, Mantis Moon, Finding Noah and Book of Thieves. A SWARM Party is an event that involves the exciting social networking, location based game Foursquare.com, which is new to South Africa but growing rapidly. Foursquare is a free online game with a phone application where you create an account and connect with your friends. When physically at a venue, you check-in to the virtual venue and can see if any of your friends are there, or where they are at that time. You can leave tips and recommendations about the venue and see nearby venues and specials they are offering. The person who checks-in virtually the most in a two month period to a certain venue becomes the "Mayor" of that venue. The more things you do on Foursquare, the more points and badges you earn which are displayed on your profile. The points are also displayed on the leaderboard so you can see if you are beating your friends or who is in the lead. Businesses can make use of foursquare to engage with their increasingly mobile customers by offering discounts and prizes to their loyal customers when they check-in virtually at their venue. They can also track how their venue and specials are performing with the free analytics. This one matchstick SWARM Party is an opportunity for South Africans to play Foursquare and unlock the hard-to-get Super Swarm Badge. It is an offline event where at least 250 people will be getting together to take part in an online Foursquare flashmob at the designated time. They will be part of the Crowd Swarm, and all 250 people who check-in on Foursquare at the venue, within the same hour, will get points and be awarded the coveted "Super Swarm Badge" on their profile. Simpson is going for a record of this SWARM Party attempting to be the first to unlock the Super Swarm Badge on the African continent, while at the same time helping her finish her tenth trade and get one step closer to making her 'one matchstick office' dream a reality. What is one matchstick about? Simpson traded a matchstick for a pen, which she traded for a toy frog, and the toy frog for two books. The books she traded for two cases of First Sighting wine, and has continued trading up in value. She is currently on her tenth trade which involves trading 375 designer T-shirts from Springleap T-shirts. She believes she will get to her office after three or four more trades. Tickets: VIP tickets for R183 include a Springleap T-shirt, two Castle Lagers and entry to the SWARM Party. General admission is R40.